I think it was George Bernard Shaw who made the following observation: ‘Reasonable men adapt themselves to the world, unreasonable men adapt the world to themselves; therefore all progress is due to unreasonable men.’ It is about swimming against the tide, doing the unthinkable, defying logic and reason and overcoming all odds. ‘Progress’ is of course a loaded term, but Shaw is essentially right in that it is those who are ‘unreasonable’, who possess powers of observation and reasoning that enable them to envisage possibilities unthinkable to most, that have a transformational impact on society. The true measure of a person’s impact on his/her social, economic, political and cultural environment is obtained only after that person is no more. All salutations should be kept on hold until then. And yet it is not impossible to praise and blame as appropriate in an interim sense. This is about a book, a biography covering 30 years in the life of a man, a document appropriately titled patisothagamiwa this wasak. My friend Karunaratne Paranavithana who reviewed this book recently in the Divaina points out that patisothagami means ‘swimming upstream’ and observes after the late Tissa Abeysekera that it is the appropriate Sinhala equivalent of ‘radical’. The term ‘radical’ has been appropriated by Marxists and others who are obsessed with the left-right dichotomy; the truth however is that radicalism is not necessarily bound by preferred political outcome or social order. The book, by the way, was authored by Patali Champika Ranawaka, the Environment and Natural Resources Minister. The book is more than Champika’s recollections of his political life. It is essential reading for students of Sri Lanka’s recent political history, especially the student movement and the agitations in the late 80s as well as the rise of the nationalist movement which peaked, one could argue, with the comprehensive military defeat of the LTTE in May 2009. It is just one man’s version and does not give the whole picture, yes. On the other hand, the man concerned was not an idle observer, but a colossus in the political firmament. I remember Upul Shantha Sannasgala speaking at a book launch several years ago, saying that there were three individuals who stood out as giants of his/our generation: Daya Pathirana (leader of the Independent Student Union, Colombo University), Ranjithan Gunaratnam, Convenor of the JVP-dominated Inter-University Student Federation and Champika. He observed that the first was murdered by the JVP, the second by vigilante groups affiliated with the UNP regime of the time and opined that had they not perished in the UNP-JVP bheeshanaya they would have definitely shaped the nature of Champika’s intellectual and political interventions in the 90s. A few years ago, Milinda Moragoda asked me what kind of person Champika was. This was my answer: ‘He is a person who reads the political equation very accurately and is capable of playing trumps no one knew existed and turn everything upside down’. Victor Ivan, editor of the Ravaya, who was also present concurred. My association with Champika goes back to the year 1990, in the immediate aftermath of the annihilation of the JVP when there was a marked political silence in the entire university system. I was introduced to him by Ven. Athureliye Rathana, a brilliant student at Peradeniya. They were instrumental in rescuing me from the intellectual reductionism and limitations of Marxism. I have known him close to two decades now. I was associated with political organizations he helped launch and have observed closely his political career as it evolved. 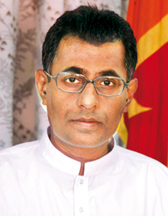 Champika was not born with a political ‘silver spoon’. He did not come from a wealthy family. And yet, this man with sheer force of determination and incredible intellectual drive left a singular mark in the political developments we saw in the past 20 years. I can safely say that I have never met anyone endowed with the creative and intellectual capacities that Champika Ranawaka possesses. He has a rare clarity of mind that allows him to sit and write an entire political column within 30 to 45 minutes, without any errors, grammatical or otherwise, and without compromising ‘lyricality’, logic and overall coherence. That quality is evident when he speaks too. There was never a word too many and he got his point across whether he had 30 minutes or three minutes. I still remember a brilliant lecture he delivered at the Institute of Fundamental Studies, Kandy at a conference on Buddhism, Science and Realism. He spoke on quantum physics. In 45 minutes he was able to explain the most complex theories to people who had no background on the material he referred to. A professor who taught this subject observed, ‘if I was asked to speak on this subject I would have needed three weeks worth of lectures to say what Champika just said in 45 minutes’. Champika, like Nalin de Silva and Gunadasa Amarasekara, argued that the LTTE must be and can be militarily defeated. Those were unpopular positions to take during the Chandrika Kumaratunga years. He was vilified as a racist, a Sinhala-Buddhist chauvinist. The agitational fronts he created such as the National Movement Against Terrorism played a crucial role in creating the ideological foundation from which that ultimate victory charge could be launched. Champika is not a journalist, but it would be difficult for me to name any regular columnist who could match him for volume, range of subject and argumentative power over the past two decades. When he took over the Environment Ministry, he bragged that he would show how ministries should be run. Well, he made good. Within a year he made sure that the Ministry did not require any Treasury allocations. His work in the sphere of environment has earned him a lot of respect internationally. He and I may disagree on many things, but I, like almost all his detractors would acknowledge that we are better off as a nation for the energy, intellectual punch and strong and unwavering nationalism of this man. He may come off as an aloof, humourless, matter-of-fact individual, but that’s not true. He is caring and sensitive when it matters. I still remember an incident when we were both detained (along with 12 others) at the Wadduwa Police Station. Champika was in a cell, I was handcuffed to the stairs along with Paranavithana, Janaka Bandara (who later became Public Trustee) and others. I was not in the best of moods because I had been interrogated a little while earlier and the officer who questioned me had threatened to assault me in the night. Champika must have noticed that I was a bit down in the mouth. He smuggled some biscuits to me as he passed me and spoke a few words of comfort. In all the years of our association, I have never failed to be impressed by the depth of his knowledge on a wide range of subjects, his eloquence in conversation, effectiveness in argument and to win for this country and our people victories that were thought to be unattainable. Others might be dismayed of course, and that’s understandable. Whichever way one looks at him, Ranawaka is a man to be reckoned with. In our generation, I can say with confidence, there is no one who is endowed with the skills and capacities that this man possesses. His book is therefore a window into an extraordinary political actor and one who will remain a determining force in our society. Worth a read.